Louise Theresa Smith (daughter of John Smith Jr.) was born on September 15, 1919 in New Bedford. She lived in a West New York, New Jersy for most of her adult life. Initially she lived in Bayonne and then moved to a 3-room apartment on Dewey Avenue, 64th Street, WNY. In 1958 she moved with all 5 children to Sunshine Gardens on 54th Street where she lived until 1975. She then moved to Summit Avenue, Jersey City where she primarily lived with Maria, her son Bob's wife, after Bob's sudden death in 1981. 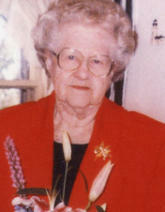 In 1990 she moved back to New Bedford and lived in her childhood home with her sister Joan until passing away in 2000 at the age of 80. 3 sons and 2 daughters (fyi, one other son died in infancy) and 7 grandchildren. Louise Theresa Smith was born in New Bedford on September 15, 1919. She was delivered at home as was the norm during this period. She was named after her mother Emma Louise. Louise passed away in New Bedford on January 6, 2000 from complications with an infection after colon cancer surgery earlier that year. Around the age of 22, Louise's fiance Henry Petty, who was a French Catholic, suddenly died about one month before their planned wedding date of May 30. Shortly after this she contracted tuberculosis and fell seriously ill. She spent about 2 years in a sanitarium and another 2 years isolated in the upstairs bedroom of her father's home. Her family was originally told she would not survive. In fact, all of the other residents in the sanitarium died except one other woman. There was no known treament at the time. Primarily it was bed rest and fresh air. They slept through the cold New England winters with the windows wide open and snow coming in. One radical procedure the doctor tried at the time was to stick a needle between her ribs to deflate one of her lungs. The plan was to let the lung heal and then they woud re-inflate. However, the one lung never recovered. Against all odds Louise recovered and lived until the age of 80. During World War II the country was under strict rationing and adults were issued Ration Books. Copy of Louise's Ration Book. Cick for more views. Born in Baxter, Garland County, Arkansas, on October 11, 1920 and died October 20, 1975. His family's residence at the time of birth was Cedar Glades, Arkansas. According to information listed on Robert Jr.'s birth certificate, his father, Robert Glenn Crawford, was 38 years old and his occupation was a farmer. His mother, Idumus Ratliff, was 24 and listed as a housekeeper. It was also noted that there were 2 other children at home at the time of his birth. It is unknown if there were additional children born after 1920. Robert Jr. was 5' 71/2" tall, brown hair, grey eyes, and 184 lbs. (per Army discharge papers, 1945). 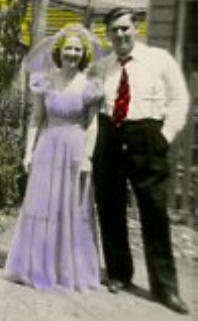 Robert and Louise met at the local USO dance at Fort Rodman in New Bedford around 1945. They were married in Bayonne at St. Henry's Rectory, on November 26, 1946, where they moved. She was 27 years old and he was 26 when they married and were together for 9 years until separating April 17, 1955. Robert was an auto mechanic for a local shop. Then in 1955 it is believed Robert was involved with a gambling debt with the mob and left town quickly. The family never reconciled. World War II Purple Heart given to Robert Crawford Jr.
Robert Glenn Crawford, father of Robert Jr., was born in 1882, (the year is based on the birth certificate of Robert Jr. The exact birth date, place of birth and date of death is unknown). Wedding information for Robert Crawford to Idumus Ratliff is unkown. Robert was 38 yrs old and Idumus was 24 at the time of Robert Jr.'s birth. They lived in Cedar Grove Arkansas and had a total of 3 children as of 1920 (per Robert Jr.'s birth certificate). Born Idumus Ratliff in 1896 (per Robert Jr.'s birth certificate, dated1920). Her birthplace and date of death is unknown.